Wandering atrial pacemaker is similar to multifocal atrial tachycardia except the heart rate is normal ― that is, less than 100 beats per minute. 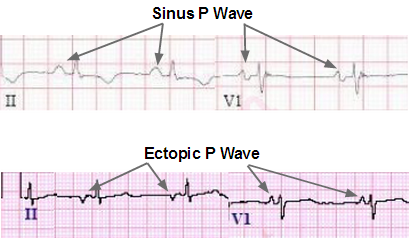 Wandering atrial pacemaker occurs when multiple areas (ectopic foci) within the atrium generate consecutive action potentials that are all conducted to the ventricles. Thus, each QRS complex will be preceded by a P wave ― though each P wave will have a different morphology, as it is originating from a different area. By definition, WAP must have at least three distinctly different P wave morphologies and a ventricular rate of less than 100 bpm. 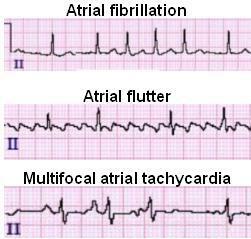 The differential diagnosis of an irregularly irregular rhythm includes atrial fibrillation, atrial flutter with variable conduction and multifocal atrial tachycardia or wandering atrial pacemaker.